Today we publish our second report in collaboration with the Social Mobility Commission and Education Datalab. Children from poor backgrounds experience a worrying drop off in progress at secondary school, new research by the Social Mobility Commission reveals today. It finds that the gap between poor pupils’ attainment at the end of primary school and the end of secondary school has widened. 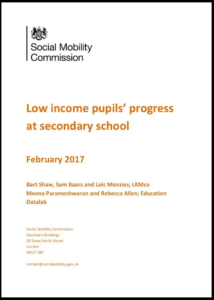 Since 2012, pupils from low-income families have been making less progress year on year, compared to their more affluent peers. Even when pupils from low-income families out-perform their more advantaged peers at primary school, they are likely to be overtaken at the next stage of their education. The report warns that the secondary school drop off means that poor children are failing to finish school with the qualifications that will create opportunities for them to succeed in life. The research, which was conducted by LKMco and Education Datalab using data from the National Pupil Database, finds that most of the gap (88 per cent) in progress stems from differences in achievement between children at the same school rather than variations between schools (12 per cent). The report suggests that this is partly due to the treatment of children on free school meals – who are more likely to be placed in lower sets, have access to less qualified teachers and have lower expectations set for them by the school. Home life can also have a big impact on progress with children from low-income families less likely to benefit from effective homework routines, access to books and computers or cultural and sporting experiences. Outcomes for children from low-income backgrounds are also affected by the fact they are more at risk of behavioral issues and exclusion from school. 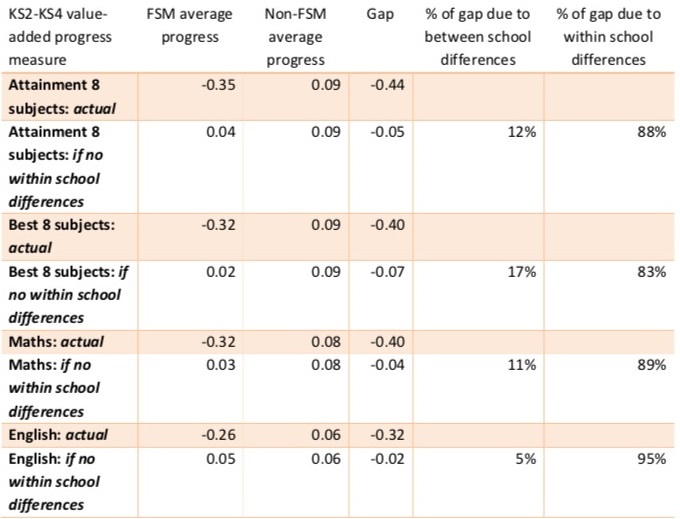 The research finds that poor pupils located in cities make more progress relative to their more affluent peers than those in rural areas and that the gap is greatest in large schools with average levels of pupil disadvantage. It also finds that poor ethnic minority pupils make better progress at secondary schools than poor white children – partly because some evidence suggests that low-income ethnic minority parents seem to provide support that is more effective for their children at home. The largest gaps in progress are between poor white children and their more affluent peers. Most low-income ethnic minority groups make progress that is in line with the national average for all pupils. School leaders interviewed as part of the research said that lower funding was already putting pupil progress at risk and that the prospects for improvement were bleak despite the new funding formula proposed by the government. With health and social care funding streams also under pressure, schools are facing reductions in external support for children with mental health disorders or SEND (Special educational needs and disabilities) – who make the least progress in secondary school. “One of the shocking features of our education system is that the gap between poor pupils and their better-off peers increases during their time in school rather than reducing. “This new research suggests that the progress they make in primary school is all but wiped out during secondary. The consequence is that successive generations of poor kids are being let down by a school system that is supposed to be there to help them move up and get on. “This is not just an issue for the Government. If social mobility is to improve, schools need to do more to bridge the education attainment divide between poorer children and their better-off classmates. Closing the gap needs to be top of mind for every teacher in every school. “Whilst we should be concerned about the high attaining pupils from low-incomes families who get overtaken at secondary school, it is at least as important to focus on low and middle attaining pupils from poorer backgrounds. “These children will continue to achieve poorly at GCSE and have diminished life chances unless more is done to accelerate their progress at secondary school. Children on free school meals achieve almost half a GCSE grade less progress in ‘Attainment 8’ core subjects than better off pupils. 88 per cent of this gap is due to differences between pupils at the same school, meaning that only 12 per cent is due to variations between schools. School culture: Pupils from low-income families are most likely to make progress in secondary schools that focus on them – both in terms of setting and sharing high expectations for pupils. Successful schools use data to track pupils’ progress and intervene swiftly and flexibly when pupils fall behind. High quality teachers, who believe that poor children are capable of making progress, are key to ensuring progress. The teaching of pupils with SEND needs should be prioritised and specialist provision should be easily and promptly accessed where needed. Pupils from low-income families are less likely to make progress when they are grouped by ability from an early age. Ensure funding cuts do not exacerbate the problem of poor pupils failing to make good progress at secondary school. Make additional funding available for schools to buy in high quality specialist provision for SEND pupils. Tackle teacher recruitment issues in areas where pupils from low-income families make low progress. Halt plans to increase selection to prevent further segregation of pupils from low- income backrounds. Set up an exclusion fund for specialist provision to reduce the chances of ‘at risk’ children being excluded. Review the quality of specialist provision for looked-after children and make more funding available to offer high quality support for these children. Head teachers must ensure that resources are targeted at KS3 and Year 7 pupils making the transition from primary school, to the same level or beyond the resources targeted at KS4. Head teachers should develop a school culture of universally high expectations, and promote practices that support those expectations. Schools should make regular use of data to analyse progress, in order to intervene as early as possible when pupils’ progress, especially those from low- economic backgrounds, stagnates or drops off. Heads of departments and senior leaders should exercise great caution in using setting and streaming practices that can negatively impact on pupils from low income backgrounds. All staff in school, particularly school leaders, should prioritise support for pupils with SEND, for example by providing continuing training which improves teachers’ skills and confidence in providing ‘quality-first’ teaching in every classroom. All school staff should improve their understanding of teaching approaches that support low prior attainers and pupils from low-income backgrounds. Senior leaders should reduce exclusion rates, particularly pupils from low-income families. Secondary schools should provide early and regular careers guidance that makes clear the links between progress at school and the freedom to choose from a wide range of careers. What did you mean with: “Home life can also have a big impact on progress with children from low-income families less likely to benefit from effective homework routines, access to books and computers or cultural and sporting experiences.” It almost seems like there is a word missing.